fracture the bone. Therefore, except in great emergencies, you should leave this treatment to specially trained medical personnel and concentrate your efforts on making the victim as comfortable as possible under the circumstances. 1. Loosen the clothing around the injured part. 2. Place the victim in the most comfortable position possible. 3. Support the injured part by means of a sling, pillows, bandages, splints, or any other device that will make the victim comfortable. 4. Treat the victim for shock. 5. Get medical help as soon as possible. You should NEVER attempt to reduce the more serious dislocations, such as those of the hip. However, if it is probable that the victim cannot be treated by a medical officer within a REASONABLE TIME, you should make a careful effort to reduce certain dislocations, such as those of the jaw, finger, or shoulder IF there is no arterial or nerve involvement (pulse is palpable and there is no numbness below the joint). Treat all other dislocations as fractures, and evacuate the victim to a definitive care facility. Figure 4-63.Position for reducing a dislocated jaw. DISLOCATION OF THE JAW. When the lower jaw is dislocated, the victim cannot speak or close the mouth. Dislocation of the jaw is usually caused by a blow to the mouth; sometimes it is caused by yawning or laughing. This type of dislocation is not always easy to reduce, and there is considerable danger that the operators thumbs will be bitten in the process. 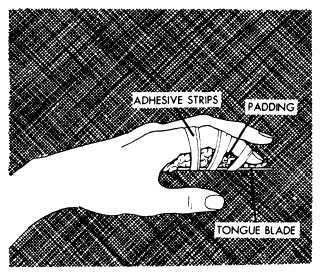 For your own protection, wrap your thumbs with a handkerchief or bandage. While facing the victim, press your thumbs down just behind the last lower molars and, at the same time, lift the chin up with your fingers. The jaw should snap into place at once; you will have to remove your thumbs quickly in order to avoid being bitten. No further treatment is required, but you should warn the victim to keep the mouth closed as much as possible during the next few hours. Figure 4-63 shows the position you must assume to reduce a dislocated jaw. prolonged loss of function. Great care must be used in treating any injury of the finger.